Work from home jobs and ways to make money online. Scam-free! Published July 9, 2018 By Anna T. This post may contain affiliate links. Regardless, I only recommend sites I've researched and/or used and trust. Community moderators are typically in charge of overseeing online communities. This could be on forums, Facebook, Twitter or any place where a group of people communicate together online. 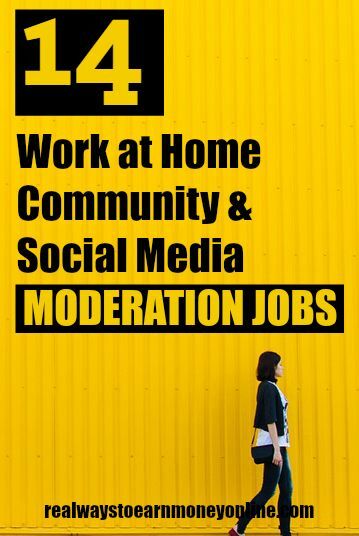 In today's post, we've listed many legitimate companies with regular openings for community or social media moderation work from home. Note that the requirements to apply will vary — some of these companies will require extensive experience while others will be more lax. Pay will vary as well. However, according to Glassdoor, most social media moderators make around $27,000 per year. Below is your list of several reputable companies that hire moderators. Please keep in mind that not all of these companies are hiring right now. If you have interest in one of the companies below but do not see jobs in the moderation field posted, just check back periodically. The companies on this list are here because they either are hiring for moderation or have hired for moderation in the past. Alchemic Dream – Read Alchemic Dream Review – Occasionally hiring work at home community managers (worldwide) to help moderate forums and social media accounts in the computer gaming industry. Being multi-lingual or bi-lingual is helpful here. Ask.com – Occasionally hiring work at home community moderators for a contract position. BabyCenter – BabyCenter is occasionally hiring work at home community moderators. It is typically a full-time contract position. BazaarVoice – This company is occasionally hiring within the US for “content analysts” to work remotely. These content analysts help moderate user-generated content across BazaarVoice's client websites. The Social Element – Read The Social Element Review – Always interested in hearing from moderators and community managers. Apply via email. Open worldwide. ICUC – Read ICUC Review – They hire people in the US & Canada to work from home doing community moderation. Prior experience is not required as they do provide training. They are not always hiring. Ignite Social Media – I have noticed this company sometimes has work from home community manager positions open. US only. Lithium – Read Lithium Review – Lithium hires people to work remotely moderating interactions on online communities organized by enterprise companies for their customers. Requires some past experience. Offers a flexible schedule. Live World – Read Live World Review – No prior experience is required to do moderation for Live World. They are almost always hiring. The role is listed as “customer service agent,” but the work is essentially social media moderation and management. Crisp Thinking – Read Crisp Thinking Review – Hires work at home social media moderators in different countries worldwide. May pay between $10 and $15 hourly. Metaverse Mod Squad – Read Metaverse Review – Mods provide digital content, child safety, message board, and chat room moderating services to enterprises with online communities and content. Yelp – Yelp hires work at home community managers regularly. However, you may need to be living in a specific location. Look on the “Jobs” page under the “Community” heading to see where they are hiring at in your area. Jobs” page, keep checking back. Zynga – Occasionally hiring community moderators to moderate forums for their vast array of online games. Prior experience is preferred. Want To Go Into Business For Yourself Instead? I always stress to my readers that while it's a little risky to strike out on your own and try to start a home business, you're going to earn way more as your own boss than you will working for someone else — assuming you can get things going. Social media management/moderation is definitely a field where people ARE striking out on their own — landing high-paying clients and setting their own rates. And social media managers and moderators are in demand. Since the rise of social media, many small businesses are desperate to get themselves “out there” online, but have no idea how to do it. So naturally, they are eager to outsource the work to someone who does know how. If you're very intrigued by social media management/moderation and you think you'd like to work for yourself rather than for someone else, Social Media Manager School is the e-course I recommend to learn what you're doing and how to find clients to get your business off the ground. You can go here to read about it and check out their free starter kit (no strings), to see if it's something you think may benefit you. This post originally published on February 10, 2013. Updated and re-published on July 9, 2018. Copyright © 2010 - 2019 RWTE, LLC. All Rights Reserved.